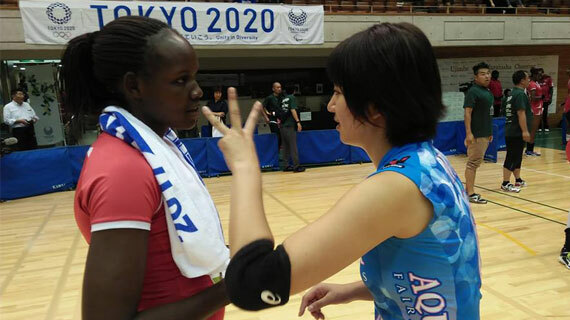 The Kenya women volleyball team has arrived in Japanese City of Hamamatsu ahead of the 2018 World Championships that serve off in Japan starting Saturday.. The team arrived in Hamamatsu after a six hour road trip from Kurobe city where they had camped for pre tournament build up. In Kurobe, Kenya played a series of friendly matches against local sides. “The hospitality in Kurobe was amazing, we had an exciting build up and we are now set to start our competition. Our target is to ensure we win at least two matches from our group as this could lead us to the second round.” Said team technical Director David Lung’aho. Kenya has been drawn in Pool D which includes 2014 bronze medallists Brazil, European giants Serbia, Kazakhstan, Puerto Rico and the Dominican Republic. Kenya will open their campaign against Kazakhstan on the opening day of the championship, September 29 before taking on Serbia then Puerto Rico and Brazil before finishing up their pool campaign on October 4 against the Dominican Republic. The world championships will be played in the Cities of Yokohama, Saporo, Kobe, Hamamatsu, Osaka and Nagoya.